The sciences do not try to explain, they hardly even try to interpret, they mainly make models. ... The justification of such a mathematical construct is solely and precisely that it is expected to work. Custom Metrics: How to Convert List of Elements into Number? Have You Considered Using Automatic Layout? 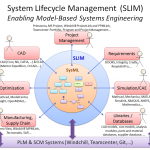 Standard Executable UML/SysML for Model-Based Testing – Is It a Dream?